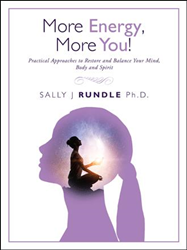 Sally J. Rundle, Ph.D., in her engaging and informative style presents not only the secrets to restore and obtain endless energy but how to bring this energy into daily life using strategies based on mental, emotional, physical and spiritual approaches in her new book, “More Energy, More You! Practical Approaches to Restore and Balance your Mind, Body and Spirit” (published by Balboa Press AU). “If we want to be the best version of ourselves and to live a full and active life we need to look at our energy in a different way. It is by understanding energy that we can become the best we can be so that we can live our lives to the fullest. To achieve this we need to understand and harness our energy in a different way. It's true that modern life brings many pressures and challenges and often we can take our energy for granted but by understanding and learning simple but effective techniques we can easily restore and balance our mind, body and spirit,” said Rundle. “More Energy, More You!” brings together current knowledge and techniques in energy management, nutritional science and exercise physiology which form the basis of optimum health. Physical strategies cover how to boost recovery, reduce pain and promote balance and prevent illness to give the body the day-to-day energy nourishment it needs as it moves through eating, sleeping, playing, moving, pausing and stopping. For mental well-being there are concepts to help gain clarity and to release mental blocks; while emotional strategies seek to improve resilience and to release trauma. Spiritually, astute wisdom and guidance can help to restore and re-connect the reader to their own intuition, purpose and presence. The book is available for purchase at: https://www.amazon.com/More-Energy-You-Practical-Approaches/dp/1504315847. By Sally J. Rundle, Ph.D.
Sally J. Rundle, Ph.D., holds a postgraduate diploma in energy medicine, counterbalanced by her international doctorate in business. She is a coach with the HeartMath Institute USA, a world leader in scientific tools to help people bridge the connection between their hearts and minds. Together with her training in emotional freedom therapy, hypnosis, past life regression, reiki and dream analysis, Rundle helps people intellectually, emotionally and energetically.